Keep your hairdressing scissors sharp at all times. 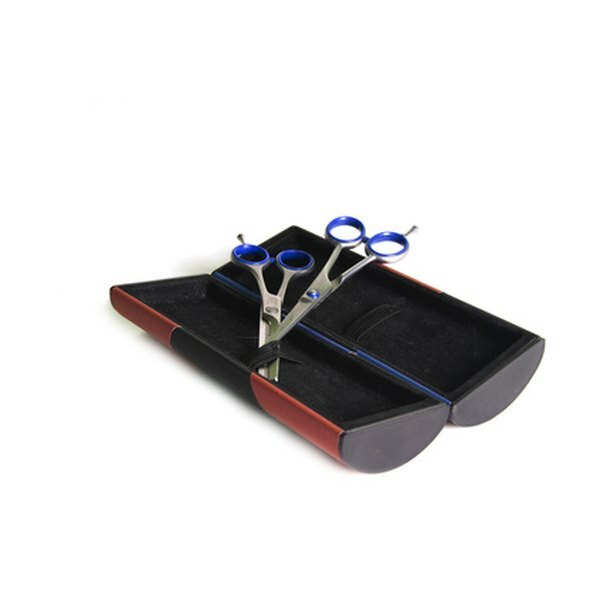 Hairdressing scissors are made to be very sharp to cut perfect lines into the hair. When the blades dull, they can cut jagged ends into the hair making it look like your client has splint ends. Although many companies will allow you to send your shears in to be professionally sharpened, you can learn to sharpen your scissors on your own, saving you both time and money. Sharpening your own scissors is not difficult or time consuming, and having sharp scissors means giving better haircuts. Soak the sharpening stone in a pot with light machine oil overnight. Pour enough oil into the pot that the entire stone is covered. Open the scissors, and hold the scissors in your non-dominant hand at the pivot. With the stone in your dominant hand, place it up to the scissors pivot (where the two blades cross). Strike the stone down the blade from the pivot to the point. Repeat this process a total of 10 times to completely sharpen the first blade. Turn the scissors around to sharpen the second blade. Repeat Step 3 to sharpen the second blade. Close the scissors and then open them again quickly. Doing this several times will remove any stone shavings or burrs from the blades. Use a damp rag to wipe any oil off of the blades and then dry them with a piece of paper towel. Clean the sharpening stone for later use. Pour 1 tbsp. of dish soap onto the stone. Use water and a scouring pad to work the stone into a lather. Rinse the stone under cool water and then place it on a dry towel to air dry.